A derivatized poly(ester amide) (D-PEA) and coatings and medical devices formed therefrom are provided. The coatings and medical devices may optionally include a biobeneficial material and/or a biocompatible polymer and/or a bioactive agent. The medical devices can be implanted in a patient to treat, prevent, or ameliorate a disorder such as atherosclerosis, thrombosis, restenosis, hemorrhage, vascular dissection or perforation, vascular aneurysm, vulnerable plaque, chronic total occlusion, claudication, anastomotic proliferation for vein and artificial grafts, bile duct obstruction, ureter obstruction, tumor obstruction, or combinations thereof. This invention generally relates to a derivatized poly(ester amide) composition useful for coating an implantable device such as a drug delivery stent. Blood vessel occlusions are commonly treated by mechanically enhancing blood flow in the affected vessels, such as by employing a stent. Stents act as scaffoldings, functioning to physically hold open and, if desired, to expand the wall of the passageway. Typically stents are capable of being compressed, so that they can be inserted through small lumens via catheters, and then expanded to a larger diameter once they are at the desired location. Stents are used not only for mechanical intervention but also as vehicles for providing biological therapy. Biological therapy can be achieved by medicating the stents. Medicated stents provide for the local administration of a therapeutic substance at the diseased site. Local delivery of a therapeutic substance is a preferred method of treatment because the substance is concentrated at a specific site and thus smaller total levels of medication can be administered in comparison to systemic dosages that often produce adverse or even toxic side effects for the patient. One method of medicating a stent involves the use of a polymeric carrier coated onto the surface of the stent. A composition including a solvent, a polymer dissolved in the solvent, and a therapeutic substance dispersed in the blend is applied to the stent by immersing the stent in the composition or by spraying the composition onto the stent. The solvent is allowed to evaporate, leaving on the stent surfaces a coating of the polymer and the therapeutic substance impregnated in the polymer. Generally, a polymer forming a coating composition for an implantable device has to be biologically benign. The polymer is preferably biocompatible and bioabsorbable. One such polymer is poly(ester amide). Poly(ester amide) (PEA) has excellent biocompatibility. However, a coating formed of PEA can incur mechanical failures. In addition, PEA is more permeable to a drug such as everolimus than ethylene vinyl (EVAL) alcohol copolymer and polyvinylidene fluoride (Solefr™). In order to achieve a proper level of residence time of an agent in a coated stent, it would require thicker coatings to meet release rate targets. Therefore, there is a need for a PEA coating composition that provides for a controlled release of a bioactive agent and improved mechanical properties. The compositions and the coatings formed thereof disclosed herein address the above described problems and needs. An embodiment of the present invention provides a biobeneficial composition that contains a derivatized poly(ester amide) (D-PEA) for coating a medical device such as a stent or forming an implantable medical device itself such as a stent. The D-PEA contains a biobeneficial moiety. The implantable device or coating can optionally include a bioactive agent for controlled release of the agent. Some exemplary bioactive agents are paclitaxel, docetaxel, estradiol, nitric oxide donors, super oxide dismutases, super oxide dismutases mimics, 4-amino-2,2,6,6-tetramethylpiperidine-1-oxyl(4-amino-TEMPO), tacrolimus, dexamethasone, rapamycin, rapamycin derivatives, 40-O-(2-hydroxy)ethyl-rapamycin (everolimus), 40-O-(3-hydroxy)propyl-rapamycin, 40-O-[2-(2-hydroxy)ethoxy]ethyl-rapamycin, and 40-O-tetrazole-rapamycin, ABT-578, clobetasol, prodrugs thereof, co-drugs thereof, and combinations thereof. The implantable device can be implanted in a patient to treat or prevent a disorder such as atherosclerosis, thrombosis, restenosis, hemorrhage, vascular dissection or perforation, vascular aneurysm, vulnerable plaque, chronic total occlusion, claudication, anastomotic proliferation for vein and artificial grafts, bile duct obstruction, ureter obstruction, tumor obstruction, or combinations thereof. FIG. 1 shows the in vitro release of DES coatings containing a derivatized poly(ester amide) polymer. In one embodiment of the present invention, a biobeneficial composition is provided that contains a derivatized poly(ester amide) (D-PEA), optionally with another biocompatible polymer and/or a biobeneficial material, for coating a medical device such as a stent or forming the implantable medical device itself The D-PEA contains a moiety derived from another biocompatible polymer or from a biobeneficial material. Preferably, the D-PEA contains a moiety derived from a biobeneficial material. The implantable device or coating can optionally include a bioactive agent for controlled release of the agent. Some exemplary bioactive agents are paclitaxel, docetaxel, estradiol, nitric oxide donors, super oxide dismutases, super oxide dismutases mimics, 4-amino-2,2,6,6-tetramethylpiperidine-1-oxyl (4-amino-TEMPO), tacrolimus, dexamethasone, rapamycin, rapamycin derivatives, 40-O-(2-hydroxy)ethyl-rapamycin (everolimus), 40-O-(3-hydroxy)propyl-rapamycin, 40-O-[2-(2-hydroxy)ethoxy]ethyl-rapamycin, and 40-O-tetrazole-rapamycin, ABT-578, clobetasol, prodrugs thereof, co-drugs thereof, and combinations thereof. The implantable device can be implanted in a patient to treat or prevent a disorder such as atherosclerosis, thrombosis, restenosis, hemorrhage, vascular dissection or perforation, vascular aneurysm, vulnerable plaque, chronic total occlusion, claudication, anastomotic proliferation for vein and artificial grafts, bile duct obstruction, ureter obstruction, tumor obstruction, or combinations thereof. Poly(ester amide) (PEA) is a class of polymer having both ester and amide functionalities in its backbone. It is generally formed of a diacid and another moiety having both amino and ester functionalities. One of such PEA is described in, e.g., U.S. Pat. No. 6,503,538, B1. The diacid is preferably a C2-C12 diacid, aliphatic or with unsaturation. The amino acid can be, for example, glycine, valine, alanine, proline, glutamine, methionine, leucine, isoleucine, or phenylalanine. An optional second amino acid may be included. The second amino acid can be, for example, lysine, tyrosine, tryptophan, arginine, histidine, glutamic acid, aspartic acid, threonine, serine, or cysteine. The second amino acid may contain a side group to enable the attachment of pharmacologically active compounds or property modifiers. PEA polymers with various thermal properties can be readily prepared by varying these components during synthesis. 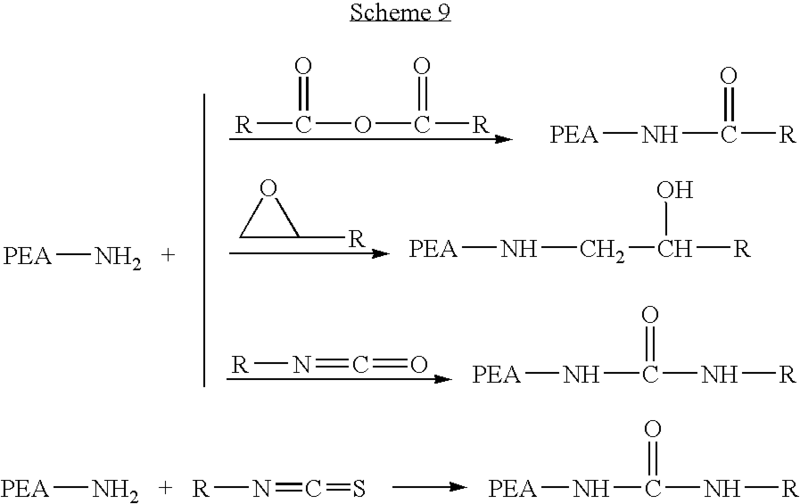 PEA can be made by condensation polymerization utilizing, among others, diamino subunits and dicarboxylic acids (Scheme I). In Scheme I, the dicarboxylic acids are converted to an active di-p-nitrophenyl derivative. As shown in Scheme I, when the dicarboxylic acid and the diamino subunits are used stoichiometrically, the PEA formed would have one terminal carboxylic acid group and one terminal amino group. When the dicarboxylic acid and the diamino subunits are not used at a ratio of 1:1, the PEA thus formed can have end groups in favor of the carboxylic acid group, if the dicarboxylic acid subunit is used more than the diamino subunit, or in favor of the amino group, if the diamino subunit is used more than the dicarboxylic acid subunit. Accordingly, the PEA molecule would have reactive carboxylic acid or amino end groups. In one embodiment, the biobeneficial material can be used to derivatize a PEA polymer to form the derivatized PEA polymer (D-PEA) described herein, which is used to form a coating or an implantable device. In another embodiment, the biobeneficial material can be used in combination with the D-PEA to form a coating of an implantable device. The biobeneficial material can be a polymeric material or non-polymeric material. The biobeneficial material is preferably flexible and biocompatible and/or biodegradable (a term which includes bioerodable and bioabsorbable), more preferably non-toxic, non-antigenic and non-immunogenic. A biobeneficial material is one which enhances the biocompatibility of a device by being non-fouling, hemocompatible, actively non-thrombogenic, pro-endothelial cell proliferation, or anti-inflammatory, all without depending on the release of a pharmaceutically active agent. Generally, the biobeneficial material has a relatively low glass transition temperature (Tg), e.g., a Tg below or significantly below that of the biocompatible polymer, described below. In some embodiments, the Tg is below human body temperature. This attribute would, for example, render the biobeneficial material relatively soft as compared to the biocompatible polymer and allows a layer of coating containing the biobeneficial material to fill any surface damages that may arise when an implantable device is coated with a layer comprising the biocompatible polymer. For example, during radial expansion of the stent, a more rigid biocompatible polymer can crack or have surface fractures. A softer biobeneficial material can fill in the crack and fractures. Another attribute of a biobeneficial material is hydrophilicity. Hydrophicility of the coating material would affect the drug release rate of a drug-delivery coating and, in the case that the coating material is biodegradable, would affect the degradation rate of the coating material. Generally, the higher hydrophilicity of the coating material, the higher the drug release rate of the drug-delivery coating and the higher the degradation rate of the coating if it is biodegradable. Representative biobeneficial materials include, but are not limited to, polyethers such as poly(ethylene glycol) (PEG), copoly(ether-esters) (e.g. poly(ethylene oxide)/polylactide (PEO/PLA)); polyalkylene oxides such as poly(ethylene oxide), poly(propylene oxide), poly(ether ester), polyalkylene oxalates, polyphosphazenes, phosphoryl choline, choline, poly(aspirin), polymers and co-polymers of hydroxyl bearing monomers such as hydroxyethyl methacrylate (HEMA), hydroxypropyl methacrylate (HPMA), hydroxypropylmethacrylamide, poly (ethylene glycol) acrylate (PEGA), PEG methacrylate, 2-methacryloyloxyethylphosphorylcholine (MPC) and n-vinyl pyrrolidone (VP), carboxylic acid bearing monomers such as methacrylic acid (MA), acrylic acid (AA), alkoxymethacrylate, alkoxyacrylate, and 3-trimethylsilylpropyl methacrylate (TMSPMA), poly(styrene-isoprene-styrene)-PEG (SIS-PEG), polystyrene-PEG, polyisobutylene-PEG, polycaprolactone-PEG (PCL-PEG), PLA-PEG, poly(methyl methacrylate)-PEG (PMMA-PEG), polydimethylsiloxane-co-PEG (PDMS-PEG), poly(vinylidene fluoride)-PEG (PVDF-PEG), PLURONIC™ surfactants (polypropylene oxide-co-polyethylene glycol), poly(tetramethylene glycol), hydroxy functional poly(vinyl pyrrolidone), biomolecules such as fibrin, fibrinogen, cellulose, starch, collagen, dextran, dextrin, hyaluronic acid, fragments and derivatives of hyaluronic acid, heparin, fragments and derivatives of heparin, glycosamino glycan (GAG), GAG derivatives, polysaccharide, elastin, chitosan, alginate, silicones, and combinations thereof. In some embodiments, the polymer can exclude any one of the aforementioned polymers. In an embodiment, the biobeneficial material is a block copolymer having flexible poly(ethylene glycol) and poly(butylene terephthalate) blocks (PEGT/PBT) (e.g., PolyActive™). PolyActive™ is intended to include AB, ABA, BAB copolymers having such segments of PEG and PBT (e.g., poly(ethylene glycol)-block-poly(butyleneterephthalate)-block poly(ethylene glycol) (PEG-PBT-PEG). In further embodiment, the biobeneficial material can be poly(ethylene glycol), peptide ampihile, a nitric oxide preserver such as 4-amino-2,2,6,6-tetramethylpiperidine-N-oxyl (4-amino-TEMPO), pro-healing polymers such as NO-donor polymers, hyaluronic acid, carbon nanotubes, and fullerenes. The biocompatible polymer that can be used with the D-PEA described herein in the coatings or medical devices described herein can be any biocompatible polymer known in the art, which can be biodegradable or nondegradable. Representative examples of polymers that can be used to coat an implantable device in accordance with the present invention include, but are not limited to, poly(ester amide) that is not the D-PEA defined herein, ethylene vinyl alcohol copolymer (commonly known by the generic name EVOH or by the trade name EVAL), poly(hydroxyvalerate), poly(L-lactic acid), poly(L-lactide), poly(D,L-lactide), poly(L-lactide-co-D,L-lactide), polycaprolactone, poly(lactide-co-glycolide), poly(hydroxybutyrate), poly(hydroxybutyrate-co-valerate), polydioxanone, polyorthoester, polyanhydride, poly(glycolic acid), poly(D,L-lactic acid), poly(D,L-lactide-co-glycolide) (PDLLAGA), poly(glycolic acid-co-trimethylene carbonate), polyphosphoester, polyphosphoester urethane, poly(amino acids), polycyanoacrylates, poly(trimethylene carbonate), poly(iminocarbonate), poly(butylene terephthalate-co-PEG-terephthalate), polyurethanes, polyphosphazenes, silicones, polyesters, polyolefins, polyisobutylene and ethylene-alphaolefin copolymers, acrylic polymers and copolymers, vinyl halide polymers and copolymers, such as polyvinyl chloride, polyvinyl ethers, such as polyvinyl methyl ether, polyvinylidene halides, such as vinylidene fluoride based home or copolymer under the trade name Solefr™ or Kynar™, for example, polyvinylidene fluoride (PVDF) or poly(vinylidene-co-hexafluoropropylene) (PVDF-co-HFP) and polyvinylidene chloride, polyacrylonitrile, polyvinyl ketones, polyvinyl aromatics, such as polystyrene, polyvinyl esters, such as polyvinyl acetate, copolymers of vinyl monomers with each other and olefins, such as ethylene-methyl methacrylate copolymers, acrylonitrile-styrene copolymers, ABS resins, and ethylene-vinyl acetate copolymers, polyamides, such as Nylon 66 and polycaprolactam, alkyd resins, polycarbonates, polyoxymethylenes, polyimides, polyethers, poly(glyceryl sebacate), poly(propylene fumarate), epoxy resins, polyurethanes, rayon, rayon-triacetate, cellulose acetate, cellulose butyrate, cellulose acetate butyrate, cellophane, cellulose nitrate, cellulose propionate, cellulose ethers, and carboxymethyl cellulose. A preferred biocompatible polymer is poly(ester amide), poly(ortho esters), poly(anhydrides), poly(D,L-lactic acid), poly (L-lactic acid), poly(glycolic acid), copolymers of poly(lactic) and glycolic acid, poly(L-lactide), poly(D,L-lactide), poly(L-lactide-co-D,L-lactide), poly(L-lactide-co-glycolide), poly(D,L-lactide-co-glycolide), poly(phosphoesters), poly(trimethylene carbonate), poly(oxaesters), poly(oxaamides), poly(ethylene carbonate), poly(propylene carbonate), poly(phosphoesters), poly(phosphazenes), poly(tyrosine derived carbonates), poly(tyrosine derived arylates), poly(tyrosine derived iminocarbonates), copolymers thereof with poly(ethylene glycol), or combinations thereof. The PEA can be modified via the terminal carboxyl groups or amino groups. 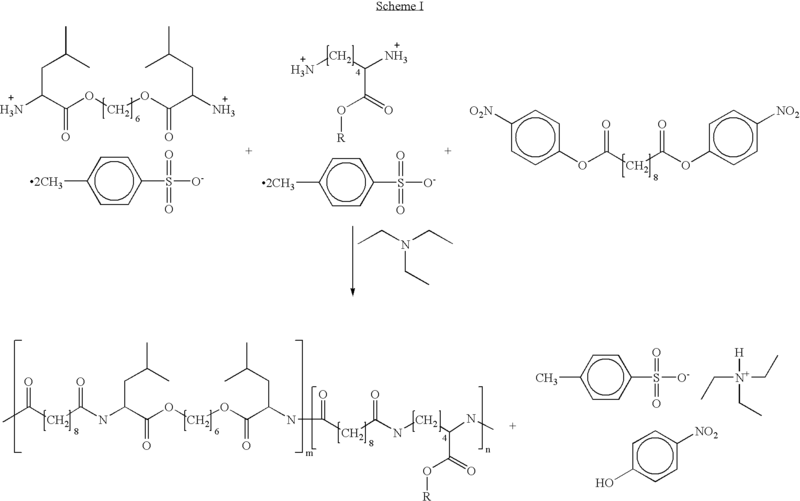 The following embodiments describe some exemplary methods of derivatizing a PEA polymer. In some embodiments, a D-PEA can be formed via the carboxyl group of the PEA polymer by reacting the carboxyl group with a biobeneficial material having a functional group capable of reacting with the carboxyl group, as shown in Scheme 2. The functional group of the biobeneficial moiety can be any functional group capable of reacting with a carboxyl group. Such functional groups can be a reactive group or a leaving group, which include, but are not limited to, hydroxyl, thiol, amino, carboxyl, ester, keto, aldehyde, halide, tosylate, or mesylate. In scheme 2, the carboxyl on the PEA may also be an activated carboxyl such as a p-nitrophenyl derivative, acid halide, or N-hydroxysuccinimidyl derivative. In one embodiment, the biobeneficial material has a carboxyl group and can be coupled to a PEA polymer via carboxyl-carboxyl coupling. This coupling can be mediated by, for example, a water soluble carbodiimide such as (1-ethyl-3-(3-(dimethylamino)propyl)carbodiimide (EDC), or an organic soluble carbodiimide such as dicyclohexylcarbodiimide to yield an anhydride linkage. Amine terminated biobeneficial material can be directly coupled to carboxylic acid moieties using an agent such as a carbodiimide, specifically EDC mediated by an agent such as N-hydroxybenzotriazole (HOBT), substituted HOBT, or N-hydroxysuccinamide. In another aspect of the present invention, a PEA polymer having carboxyl groups on its backbone can be coupled to a hydrazide reactive group in an aqueous medium such as water. A linking agent with at least two hydrazide reactive groups would be capable of coupling the PEA polymer with a biobeneficial material having carboxylic acid groups. In order to avoid crosslinking of a biobeneficial material bearing multiple carboxylic acid groups by the linking agent, the reaction can be done in an excess of the linking agent such as a dihydrazide, and the degree of functionalization can be controlled by the amount of a carbodiimide such as EDC (Scheme 3) (Luo, Y. et al., J. Contr. Release 69:169-184 (2000)). The functionalized PEA, which has a remaining hydrazide group, can react with the carboxylic acid residue on the biobeneficial material using the carbodiimide chemistry. Alternately, the functionalized PEA can be coated onto a medical device, and the biobeneficial material can then be grafted onto the coating using the carbodiimide chemistry. In accordance with a further aspect of the present invention, a multifunctional aziridine agent can be used as a crosslinker to couple the PEA polymer with a biobeneficial material having carboxylic acid groups. For example, pentaerythritol tris(3-aziridinopropionate) from Sybron Chemicals (NJ) can be used as a crosslinker (see, for example, Gianolino, D. A., et al., Crosslinked sodium hyaluronate containing labile linkages, Abstract from Society for Biomaterials 2002) (Scheme 4). 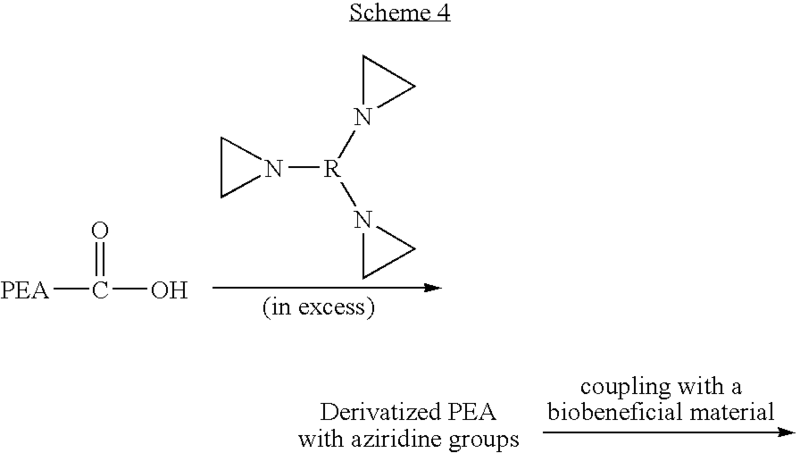 In the derivatized PEA shown in Scheme, some residual aziridine groups will still be available at the surface to graft PEA and a biobeneficial material with carboxyl functionality. In another aspect of the present invention, a multifunctional carbodiimide can be used to attach the PEA polymer to a biobeneficial material with carboxylic acid functionalities (see Scheme 5). Multifunctional carbodiimides are available from Nisshinbo (CARBODILITE™) and Bayer (BAYDERM™ Fix CD). The PEA crosslinked according to Scheme 5 can have unreacted carbodiimide groups, and thus can be readily coupled to a biobeneficial material. 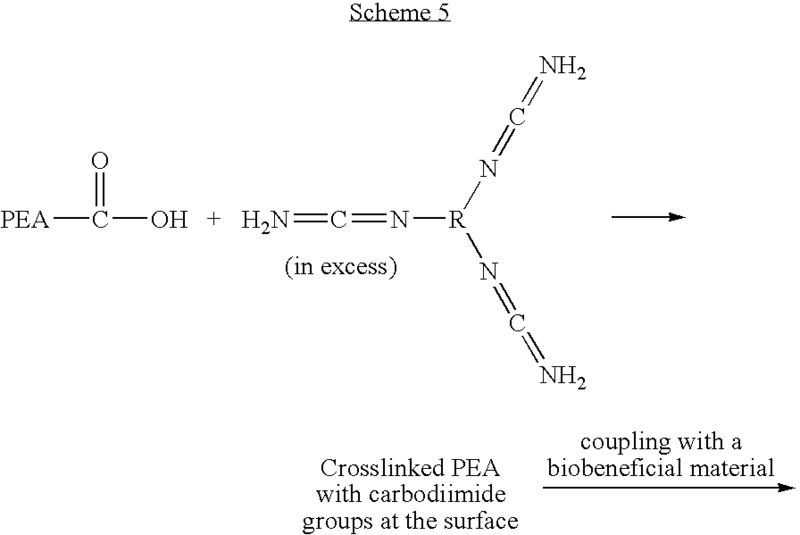 In accordance with a further aspect of the present invention, the PEA polymer can be attached to a biobeneficial material bearing primary amine functionalities via direct EDC mediated amide formation between the amine groups and the carboxyls of the PEA polymer. For example, monomers having primary amine functional functionality such as N-(3-aminopropyl)methacrylamide HCl (available from Polysciences), ethyl 3-aminocrotonate (available from Aldrich), ethyl 3-amino-4,4,4-trifluorocrotonate (available from Aldrich), or combinations thereof can undergo polymerization reaction to form a polymer bearing pendant primary amine groups. The primary amine groups can react with a biobeneficial moiety such as succinimidyl poly(ethylene glycol) (PEG) and the PEA polymer with carboxyl groups to form a D-PEA with a biobeneficial moiety. This reaction proceeds best when the carbon atom bearing the leaving group is primary or secondary. In Scheme 9, R is a biobeneficial material. Fullerenes are compounds formed of pure carbon atoms whose molecular structure is characterized by alternating carbon-carbon double bonds that form interconnected and fused aromatic rings forming a closed structure. One such fullerenes is C60, which is commonly called “buckyball.” It has been fully documented that fullerenes can be derivatized and functionalized. See, for example, Fullerenes: Chemistry, Physics, and Technology, Karl M. Kadish (Editor), Rodney S. Ruoff (Editor). For example, fullerenes can be functionalized to attach functional groups such as halides, carboxylic groups, keto, amino, ester, hydroxyl, and other functional groups to the molecule. See, e.g., Yang, et al., “Design and synthesis of fullerene-based amino acids,” Abstract, 228th ACS National Conference, Philadelphia, Aug. 22-26, 2004, for attaching amino acids to fullerenes, Diederich, F., Pure & Appl. Chem., 69:395-400 (1997), for functionalizing fullerenes with acetylene, silanes, esters, and hydroxyl groups. Note, these functional groups would allow further derivatization or functionalization of fullerene by standard organic methodology such as catalytic hydration, reduction, oxidization, derivatization with halides, and/or hydrolysis. See, for example, Fullerenes: Chemistry, Physics, and Technology, Karl M. Kadish (Editor), Rodney S. Ruoff (Editor). The functionalized fullerenes can be attached to a PEA polymer per the methods described above. The D-PEA polymer described herein can form a coating or a medical device such as a stent with one or more bioactive agents. These bioactive agents can be any agent, which is a therapeutic, prophylactic, or diagnostic agent. These agents can have anti-proliferative or anti-inflammatory properties or can have other properties such as antineoplastic, antiplatelet, anti-coagulant, anti-fibrin, antithrombonic, antimitotic, antibiotic, antiallergic, antioxidant as well as cystostatic agents. Examples of suitable therapeutic and prophylactic agents include synthetic inorganic and organic compounds, proteins and peptides, polysacchamides and other sugars, lipids, and DNA and RNA nucleic acid sequences having therapeutic, prophylactic or diagnostic activities. Nucleic acid sequences include genes, antisense molecules which bind to complementary DNA to inhibit transcription, and ribozymes. Some other examples of other bioactive agents include antibodies, receptor ligands, enzymes, adhesion peptides, blood clotting factors, inhibitors or clot dissolving agents such as streptokinase and tissue plasminogen activator, antigens for immunization, hormones and growth factors, oligonucleotides such as antisense oligonucleotides and ribozymes and retroviral vectors for use in gene therapy. Examples of anti-proliferative agents include rapamycin and-its functional or structural derivatives, 40-O-(2-hydroxy)ethyl-rapamycin (everolimus), and its functional or structural derivatives, paclitaxel and its functional and structural derivatives. Examples of rapamycin derivatives include methyl rapamycin (ABT-578), 40-O-(3-hydroxy)propyl-rapamycin, 40-O-[2-(2-hydroxy)ethoxy]ethyl-rapamycin, and 40-O-tetrazole-rapamycin. Examples of paclitaxel derivatives include docetaxel. Examples of antineoplastics and/or antimitotics include methotrexate, azathioprine, vincristine, vinblastine, fluorouracil, doxorubicin hydrochloride (e.g. Adriamycin® from Pharmacia & Upjohn, Peapack N.J.), and mitomycin (e.g. Mutamycin® from Bristol-Myers Squibb Co., Stamford, Conn.). Examples of such antiplatelets, anticoagulants, antifibrin, and antithrombins include sodium heparin, low molecular weight heparins, heparinoids, hirudin, argatroban, forskolin, vapiprost, prostacyclin and prostacyclin analogues, dextran, D-phe-pro-arg-chloromethylketone (synthetic antithrombin), dipyridamole, glycoprotein IIbb/IIIa platelet membrane receptor antagonist antibody, recombinant hirudin, thrombin inhibitors such as Angiomax ä (Biogen, Inc., Cambridge, Mass. ), calcium channel blockers (such as nifedipine), colchicine, fibroblast growth factor (FGF) antagonists, fish oil (omega 3-fatty acid), histamine antagonists, lovastatin (an inhibitor of HMG-CoA reductase, a cholesterol lowering drug, brand name Mevacor® from Merck & Co., Inc., Whitehouse Station, N.J.), monoclonal antibodies (such as those specific for Platelet-Derived Growth Factor (PDGF) receptors), nitroprusside, phosphodiesterase inhibitors, prostaglandin inhibitors, suramin, serotonin blockers, steroids, thioprotease inhibitors, triazolopyrimidine (a PDGF antagonist), nitric oxide or nitric oxide donors, super oxide dismutases, super oxide dismutase mimetic, 4-amino-2,2,6,6-tetramethylpiperidine-1-oxyl (4-amino-TEMPO), estradiol, anticancer agents, dietary supplements such as various vitamins, and a combination thereof. Examples of anti-inflammatory agents including steroidal and non-steroidal anti-inflammatory agents include tacrolimus, dexamethasone, clobetasol, combinations thereof. Examples of such cytostatic substance include angiopeptin, angiotensin converting enzyme inhibitors such as captopril (e.g. Capoten® and Capozide® from Bristol-Myers Squibb Co., Stamford, Conn.), cilazapril or lisinopril (e.g. Prinivil® and Prinzide® from Merck & Co., Inc., Whitehouse Station, N.J.). An example of an antiallergic agent is permirolast potassium. Other therapeutic substances or agents which may be appropriate include alpha-interferon, bioactive RGD, and genetically engineered epithelial cells. The foregoing substances can also be used in the form of prodrugs or co-drugs thereof. The foregoing substances are listed by way of example and are not meant to be limiting. Other active agents which are currently available or that may be developed in the future are equally applicable. The dosage or concentration of the bioactive agent required to produce a favorable therapeutic effect should be less than the level at which the bioactive agent produces toxic effects and greater than the level at which non-therapeutic results are obtained. The dosage or concentration of the bioactive agent required can depend upon factors such as the particular circumstances of the patient; the nature of the tissues being delivered to; the nature of the therapy desired; the time over which the ingredient administered resides at the vascular site; and if other active agents are employed, the nature and type of the substance or combination of substances. Therapeutic effective dosages can be determined empirically, for example by infusing vessels from suitable animal model systems and using immunohistochemical, fluorescent or electron microscopy methods to detect the agent and its effects, or by conducting suitable in vitro studies. Standard pharmacological test procedures to determine dosages are understood by one of ordinary skill in the art. In another aspect of the present invention, the D-PEA can be used to form coatings that provide for controlled release of drugs. The D-PEA can be used alone or in combination with a biocompatible, non-bioabsorbable polymer or with a biocompatible, bioabsorbable polymer described above to form a controlled release matrix with a drug. This matrix can be coated onto a medical device such as a stent to form a drug reservoir layer of coating. In one embodiment, the D-PEA, optionally with a biobeneficial material and/or a biocompatible polymer, can also be top coated onto the drug reservoir layer to provide a controlled release of the drug. In some embodiments, the controlled drug release coating construct includes a layer of coating that includes drug matrix which can be a bioabsorbable. A layer of coating that includes a D-PEA described above, optionally with a biobeneficial material (e.g., PolyActive™) and/or a biocompatible polymer, can be coated beneath and/or on top of the drug matrix layer to provide a controlled release of the drug. In some embodiments, the controlled drug release coating construct includes a drug matrix containing a drug and a bioabsorbable polymer, a layer of a bioabsorbable polymer which is not D-PEA coated beneath the drug matrix, and a layer of D-PEA coated on top of the drug matrix to provide a controlled release of the drug. In some other embodiments, the drug matrix can contain a non-degradable polymer and a drug. A layer of a D-PEA or a mixture of D-PEAs can be coated on top of the drug matrix to provide controlled release of the drug. Any non-degradable, biocompatible polymer can be used to form this coating construct. In one embodiment, the non-degradable, biocompatible polymer is Solef™ polymer described above. The D-PEA can be any derivatized PEA, one example of which is PEA-PEG. In some further embodiments, the D-PEA can be used to modify the drug release rate of a PolyActive™ coating. For example, the D-PEA can be coated onto a medical device together with PolyActive™, optionally with a drug. A layer of pure PolyActive™ can then be coated on top of the layer of D-PEA/PolyActive™ , which optionally includes a drug. As used herein, an implantable device may be any suitable medical substrate that can be implanted in a human or veterinary patient. Examples of such implantable devices include self-expandable stents, balloon-expandable stents, stent-grafts, grafts (e.g., aortic grafts), artificial heart valves, cerebrospinal fluid shunts, pacemaker electrodes, and endocardial leads (e.g., FINELINE and ENDOTAK, available from Guidant Corporation, Santa Clara, Calif.). The underlying structure of the device can be of virtually any design, for example, metallic stents with channels, pores, perforations or depots. The device can be made of a metallic material or an alloy such as, but not limited to, cobalt chromium alloy (ELGILOY), stainless steel (31 6L), high nitrogen stainless steel, e.g., BIODUR 108, cobalt chrome alloy L-605, “MP35N,” “MP20N,” ELASTINITE (Nitinol), tantalum, nickel-titanium alloy, platinum-iridium alloy, gold, magnesium, or combinations thereof. “MP35N” and “MP20N” are trade names for alloys of cobalt, nickel, chromium and molybdenum available from Standard Press Steel Co., Jenkintown, Pa. “MP35N” consists of 35% cobalt, 35% nickel, 20% chromium, and 10% molybdenum. “MP20N” consists of 50% cobalt, 20% nickel, 20% chromium, and 10% molybdenum. Devices made from bioabsorbable or biostable polymers could also be used with the embodiments of the present invention. In accordance with embodiments of the invention, a coating of the various described embodiments can be formed on an implantable device or prosthesis, e.g., a stent. For coatings including one or more active agents, the agent will retain on the medical device such as a stent during delivery and expansion of the device, and released at a desired rate and for a predetermined duration of time at the site of implantation. Preferably, the medical device is a stent. A stent having the above-described coating is useful for a variety of medical procedures, including, by way of example, treatment of obstructions caused by tumors in bile ducts, esophagus, trachealbronchi and other biological passageways. A stent having the above-described coating is particularly useful for treating occluded regions of blood vessels caused by atherosclerosis, abnormal or inappropriate migration and proliferation of smooth muscle cells, thrombosis, and restenosis. Stents may be placed in a wide array of blood vessels, both arteries and veins. Representative examples of sites include the iliac, renal, carotid, and coronary arteries. For implantation of a stent, an angiogram is first performed to determine the appropriate positioning for stent therapy. An angiogram is typically accomplished by injecting a radiopaque contrasting agent through a catheter inserted into an artery or vein as an x-ray is taken. A guidewire is then advanced through the lesion or proposed site of treatment. Over the guidewire is passed a delivery catheter, which allows a stent in its collapsed configuration to be inserted into the passageway. The delivery catheter is inserted either percutaneously or by surgery into the femoral artery, brachial artery, femoral vein, or brachial vein, and advanced into the appropriate blood vessel by steering the catheter through the vascular system under fluoroscopic guidance. A stent having the above-described coating may then be expanded at the desired area of treatment. A post-insertion angiogram may also be utilized to confirm appropriate positioning. 12 mm small Vision™ stents (available from Guidant Corporation) were coated with 550 μg of a D-PEA/everolimus blend at a drug/polymer ratio of ¼ (w/w), the D-PEA being PEA derivatized with 4-amino-TEMPO. A solution of 2% (w/w) D-PEA and 0.5% everolimus in 200 proof ethanol was applied to the stent by spray and baked at 50° C. for one hour to remove the solvent. A topcoat of pure D-PEA was applied as a 2% (w/w) solution in ethanol by spraying until 290 μg of dry polymer solids was placed onto the stent followed by baking at 50° C. for one hour. The stents were sterilized by electron beam radiation in an argon atmosphere at a dose of 25 KGy. 12 mm small Vision™ stents (available from Guidant Corporation) were coated with 430 μg of a poly(ester amide)/everolimus blend at a drug/polymer ratio of 3 (w/w). A solution of 2% (w/w) poly(ester amide) polymer and 0.67% everolimus in 200 proof ethanol was applied to the stent by spray and baked at 50° C. for one hour to remove the solvent. A topcoat of a pure poly(ester amide) was applied as a 2% (w/w) solution in ethanol by spraying until 310 μg of dry polymer solids was placed onto the stent followed by baking at 50° C. for one hour. A biobeneficial coat of a PEA derivatized with 4-amino-TEMPO was coated from a 2% solution in 200 proof ethanol. 100 μg of dry solids was applied by spraying and baked at 50° C. for one hour. The stents were sterilized by electron beam radiation in an argon atmosphere at a dose of 25 KGy. A 2%(w/w) solution of poly(n-butyl methacrylate) in a solvent blend of 50/50 (w/w) acetone/cyclohexanone was applied by spray to an 18 mm small Vision™ stent (available from Guidant Corporation). After 80 μg of polymer was accumulated, the stents were baked at 80° C. for 30 minutes. A drug/polymer reservoir layer was formed by spraying 812 μg of everolimus/poly(vinylidene fluoride-co-hexafluoropropene) (Solef 21508) D/P1/3.115 (w/w) in a solvent blend of acetone/cyclohexanone 70/30 (w/w). After coating was placed onto the stent it was baked at 50° C. for one hour. Onto this was placed 90 μg of a PEA derivatized with 4-amino-TEMPO to serve as a biobeneficial topcoat. This was applied by spray from a 2% solids solution (w/w) in a solvent blend of 90/10 ethanol/DMAC and baked at 50° C. for one hour. For the coatings formed in Examples 1-3, the total drug content was determined by extracting the stents in acetonitrile followed by analysis of the extract by HPLC. The results are shown in Table 1. The purity of the everolimus on the stent was determined by an HPLC method that differs from the HPLC method for total content in that it is a gradient method versus isocratic, the run time is longer, and the concentration of injected drug is higher in order to quantify the small degradation peaks. Table 2 shows the results of analysis of peak purity for the three types of systems. The in-vitro release rate was measured in porcine serum by incubating the stens in porcine serum for 24 hours at 37° C. and then assaying the amount of drug left on the stent (FIG. 1). The in vitro release of these systems in a solution of 1% triton x-100 at 37° C. is shown in FIG. 2. 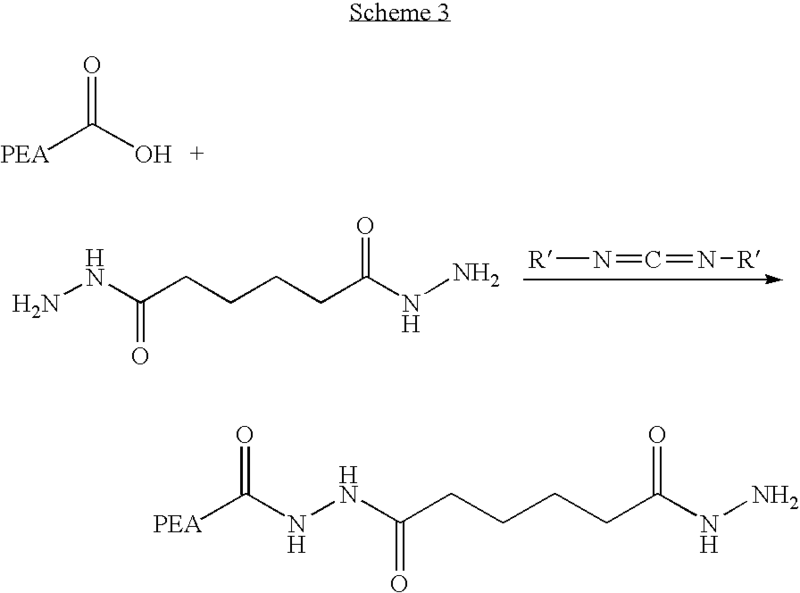 These data demonstrate that systems composed of a derivatized PEA topcoated on derivatized PEA reservoirs, D-PEA topcoated on PEA reservoirs, or D-PEA topcoated on PVDF-HFP drug reservoirs can control the release of everolimus in two in-vitro models. E-beam sterilization at 25 KGy slows the drug release rates slightly and results in only a small loss of drug content. 1. A coating on a medical device comprising a layer comprising derivatized poly(ester amide) (D-PEA). 2. The coating of claim 1, wherein the D-PEA comprises a biobeneficial moiety. 3. The coating of claim 1 wherein the biobeneficial moiety is selected from the group consisting of poly(ethylene glycol), poly(alkylene oxides), phosphoryl choline, 2-methacyloyloxyethylphosphoryl choline, poly(vinyl pyrrolidone), poly(styrene sulfonate), poly(hydroxyethyl methacrylate), poly(hydroxypropyl methacrylamide), poly(hydroxypropyl methacrylate), alkoxy methacrylates, nitric oxide preserver, peptide amphiphile, pro-healing polymers, NO-donor polymers, hyaluronic acid, fibrin, albumin, elastin, dextran, dextrin, polysaccharides, heparin, fullerenes, and a combination thereof. 4. The coating of claim 2, further comprising a biobeneficial material and optionally a biocompatible polymer. 5. The coating of claim 2, further comprising a bioactive agent. 6. The coating of claim 4 wherein the biologically active agent is selected from the group consisting of paclitaxel, docetaxel, estradiol, nitric oxide donors, super oxide dismutases, super oxide dismutase mimics, 4-amino-2,2,6,6-tetramethylpiperidine-1-oxyl (4-amino-TEMPO), tacrolimus, dexamethasone, rapamycin, rapamycin derivatives, 40-O-(2-hydroxy)ethyl-rapamycin (everolimus), 40-O-(3-hydroxy)propyl-rapamycin, 40-O-[2-(2-hydroxy)ethoxy]ethyl-rapamycin, and 40-O-tetrazole-rapamycin, ABT-578, clobetasol, progenitor cell capturing antibody, prohealing drugs, prodrugs thereof, co-drugs thereof, and a combination thereof. 7. The coating of claim 1, wherein the layer of D-PEA is coated on top of a drug matrix. 8. The coating of claim 7, wherein the drug matrix comprises a biocompatible, biodegradable polymer. 9. The coating of claim 7, wherein the drug matrix comprises a biocompatible, non-degradable polymer. 10. The coating of claim 7, wherein the drug matrix comprises a D-PEA. 11. The coating of claim 4, wherein the biobeneficial material is PolyActive™. 12. The coating of claim 1, further comprising a layer of PolyActive™ coated as a top coat. 13. The coating of claim 8, wherein the biocompatible polymer is selected from the group consisting of poly(ester amide), poly(ortho esters), poly(anhydrides), poly(D,L-lactic acid), poly (L-lactic acid), poly(glycolic acid), copolymers of poly(lactic) and glycolic acid, poly(L-lactide), poly(D,L-lactide), poly(L-lactide-co-D,L-lactide), poly(L-lactide-co-glycolide), poly(D,L-lactide-co-glycolide), poly(phospho esters), poly(trimethylene carbonate), poly(oxaesters), poly(oxaamides), poly(ethylene carbonate), poly(propylene carbonate), poly(phosphoesters), poly(phosphazenes), poly(tyrosine derived carbonates), poly(tyrosine derived arylates), poly(tyrosine derived iminocarbonates), copolymers thereof with poly(ethylene glycol), and combinations thereof. 14. The coating of claim 1, wherein the medical device is a stent. 15. The coating of claim 7, wherein the medical device is a stent. 16. The coating of claim 7, wherein the medical device is a metallic stent with channels, pores, perforations and/or depots. 17. The coating of claim 7, wherein the medical device is a metallic stent formed of a material comprising magnesium, stainless steel, cobalt-chromium alloy or nitinol. 18. A medical device formed of a material comprising a derivatized poly(ester amide) (D-PEA). 19. The medical device of claim 18, wherein the D-PEA is included in a coating layer for the device. 20. The medical device of claim 18, wherein the D-PEA comprises a moiety derived from a biobeneficial material. 21. The medical device of claim 18, further comprising a bioactive agent. 22. The medical device of claim 18 which is a stent. 23. A method of treating a disorder in a patient comprising implanting in the patient an implantable device comprising the coating of claim 1, wherein the disorder is selected from the group consisting of atherosclerosis, thrombosis, restenosis, hemorrhage, vascular dissection or perforation, vascular aneurysm, vulnerable plaque, chronic total occlusion, claudication, anastomotic proliferation for vein and artificial grafts, bile duct obstruction, ureter obstruction, tumor obstruction, and combinations thereof. 24. A method of treating a disorder in a patient comprising implanting in the patient an implantable device of claim 18, wherein the disorder is selected from the group consisting of atherosclerosis, thrombosis, restenosis, hemorrhage, vascular dissection or perforation, vascular aneurysm, vulnerable plaque, chronic total occlusion, claudication, anastomotic proliferation for vein and artificial grafts, bile duct obstruction, ureter obstruction, tumor obstruction, and combinations thereof. 25. A stent comprising a coating according to claim 1.